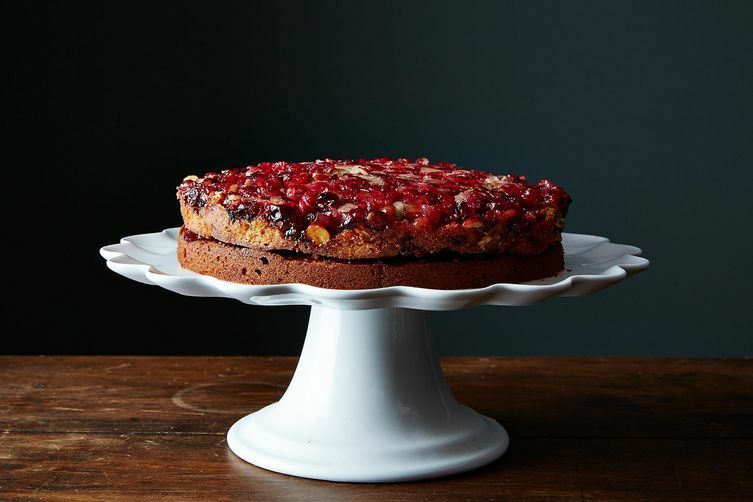 Today: A cranberry cake that's ready to be front and center at your Thanksgiving dinner. If there's anything you need to know about me, it's that I love Dorie Greenspan (see this Genius Recipe and this gush) and that I can't leave well enough alone (see putting cocoa nibs on cookies and cream bars). Maybe there are a handful of other significant parts of my personality, but those tidbits sustain a conversation with me for a couple hours (at least) and inform the story behind this cake. I had Dorie's Cranberry Upside-Downer marked in my copy of Baking from My Home to Yours, but it wasn't until recently -- when I started thinking about how cranberries might contribute to the Thanksgiving table as something other than gelatinous sauce or shriveled salad accessories -- that I got around to making it. And, when I baked it in a lonely kitchen on a Sunday afternoon, it was just what I needed. It was one of those days when brunch was supposed to carry me through to dinner but I ended up scavenging mid-afternoon. When it came out of the oven at 4 PM, I scooped a small piece, timid at first, and followed it greedily with another and another. This was a cake to keep to myself -- tart and humble and not something that would make a scene. But no matter how good it was in its own right, I was afraid it would be overshadowed at the dessert pageant that is post-turkey Thanksgiving dinner. I had to zhuzh it. I wanted it to sparkle with crystallized ginger and stand taller than the pies. I wanted it to look like nothing else in the Thanksgiving line-up. And, most importantly, I didn't want it to be unsliced on the dessert table at the end of the night, sad and droopy -- because that is my biggest baking fear. Thus explains the double layer upside-down cake. It says, "Hi there! Look at me!" in a way that's totally acceptable, and expected, on Thanksgiving. Dorie herself had the idea for the filling: a mixture of cooked cranberries, crystallized ginger, and raspberry preserves that acts as a helpful sidekick to the topping, bringing out its zest and sharpness without being distracting. The cake is denser than a typical layer cake (it'll take both finesse and confidence to slice it) and its flavor is like that of a spice cake even though it relies only on ground cinnamon. It's the combination of brown sugar, candied ginger, and toasty hazelnuts that makes it taste like a cousin of pumpkin pie and gingerbread all the same. More: 10 more Thanksgiving desserts that are not pie. The process of lifting the upside-down cake and placing it atop the bottom layer is, admittedly, daunting. But you can do it. I highly recommend letting the upside-down layer chill thoroughly in the refrigerator before you attempt to lift it from its resting place; this will help the cranberries hold together during the construction process. If some of the cranberries stick to the pan when you invert it, use that as an excuse to cover the cake wiith dollops of ginger whipped cream. And don't throw away any leftover filling -- it's great in yogurt or on toast. This turned out beautifully. I doubled the water and cranberries in the filling so it was tart enough, made the cake spicier, and used 2 sizes of cake pans; 9" for the bottom and 8.5" for the top layer. 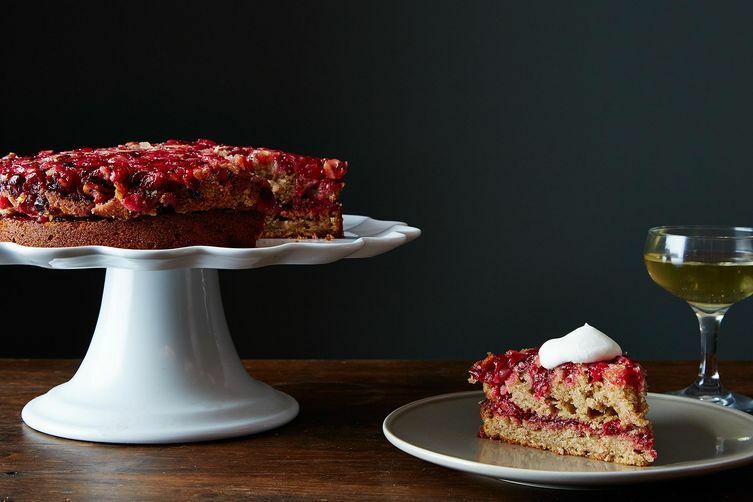 I would love to make this cake but cranberries are out of season at least at our grocers. They don't even have frozen. I suppose any of the berries like raspberries can be substituted and I can file this away for seasonal desserts. I love cranberries and I would like to know what you would substitute or where I can find fresh cranberries this summer. I did find organic frozen cranberries on Amazon. As I make this cake this morning, please know that the cake recipe is for BOTH layers. It's a little confusing in the directions because she walks you through it for two layers, but at the top, it says the amounts are for one layer. That said, the filling is beyond fabulous -- hope my guests think so! Hi Catherine, Sorry if it is confusing! I wrote "one 9-inch double layer cake," which is the same thing (at least in my mind!) as two 9-inch layers! You can just halve all of the ingredients under "For the cake" to make one 9-inch layer. Thank you for clarifying! Beautiful. And such a great opportunity to show off a nice cake stand. I'm #teampie for life, but I'll still be wanting this on my thanksgiving table. Beautiful! Your cakes always brighten my Mondays! What are the chances this could be made dairy-free with either coconut or canola oil? Slim? None? Looks delicious!